~ When did you start coming to Yen Yoga & Fitness? The style of yin and Temple as my beautiful, soulful guide shifted so much in my heart for my desire to do yoga and to release my fears of doing it. I was very intimidated to come to a studio but I chose not let that fear hold me back, I knew I wanted yoga and Yen in my life, and I came back after just a few days of moving to TC in May of 2018. ~ What was your reason for starting? 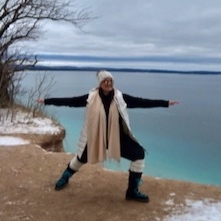 There was the physical aspect of health and the intrigue of the beautiful movement, but also the awareness that it’s connecting mind, body and soul and that called out to me deeply. It’s a pure connection of mental, physical, emotional and spiritual. Pure bliss at a core level. ~ What has been your biggest accomplishment since becoming a member at Yen Yoga & Fitness? Coming to my mat and releasing judgment of self and fear, and allowing and welcoming acceptance, forgiveness and unconditional love for myself. ~ What is your favorite class? Yin! I absolutely enjoy others and really love a slow flow or gentle to slow everything down in my life and mind...oh my that chitta vritti, but yin really hits home with the tranquility and meditative practice that it entails. I love the space, calm and healing it cultivates within myself. ~ Do you have any funny Yen moments you'd like to share, or any "meditations from the mat" moments? Many! A few would be that I practice on an empty or close to empty stomach to avoid feeling too full to get into my practice, and tacos always come into my mind during! I have to work to let taco thoughts float away like a cloud! Also while working the front desk silly things just happen, such as filling soaps with an awesome coworker and somehow they accidentally splattered shampoo on my face, hair and shirt! Or somehow tripping and face-planting in the hallway and quickly looking to see if anyone saw the epic fail! And definitely moments of laughter with clients or coworkers that leave my cheeks sore! Such beautiful, vibrant souls are within this space! ~ What advice or words of encouragement would you like to pass along to people who haven't been to Yen Yoga & Fitness? To meet yourself where you are now and embrace acceptance of self and release all judgment, because you were created beautifully and uniquely exactly how you are. Loving yourself to the core on a soul level and not wishing away your life for what you wish you had or wish you looked like. Shift your focus on what you can do and not what you can’t, to stop comparing yourself to others because it’s the thief of joy, and know that you’re amazing just as you are because everyone’s journey looks different and they are all beautiful and happening just as they are meant to.